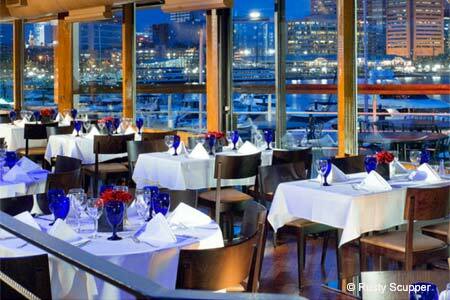 A water view and a seafood-heavy menu with international flourishes are the draws at this Inner Harbor mainstay. Entertainment: Live piano music Mon.-Sat., jazz brunch Sun. : There's a first-rate view from this spacious Inner Harbor restaurant and an interior well-crafted to take advantage of it. As the setting sun cuts a shimmering swath across the water, casting a pinkish glow over the Baltimore skyline, all's right with the world. Over the years, a succession of ambitious chefs has given the once-basic seafood place more of an international flair, adding such dishes as seared yellowfin tuna with wasabi aïoli; Cajun mussels over penne; and rockfish piccata. Non-seafood dishes include filet mignon, strip steak, and lemon-garlic roasted chicken. Of course, the simple seafood classics like crab cakes and grilled fish are still available, and the brunch buffet is cruise-ship sumptuous. Whatever you try, you’re sure to enjoy that view.